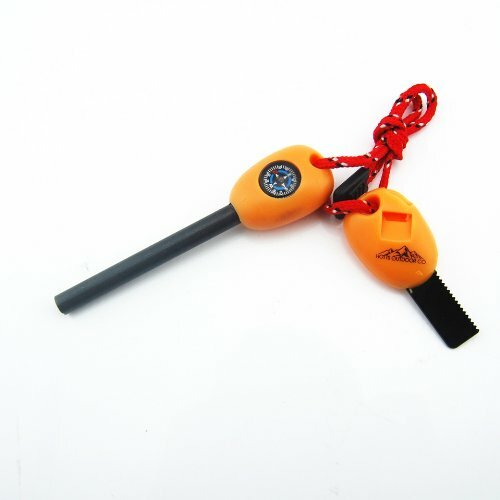 1) Remove black paint on new fire starter rod with striker or knife. 2) Take a small quantity of dry grass, paper or other combustible material and build up into a small pile. 3) Hold the fire starter rod with one hand. Hold the striker with the other hand and force the striker (on the thin straight edge, not the saw portion) down the length of the fire starter rod quickly. Position the striker at about at 25-35 degree angle for best results. This action creates the sparks that will light the combustible material. The idea is to use the sharp edge of the striker (flint) to peel or shave a tiny scrape of metal off the steel. Use extreme caution and be aware of your surroundings. To be used outdoors only. This could cause damage, injury, and/or death. This is not a toy and should not be used by children. Use at your own risk. This is an essential tool for anyone into outdoor activities. Easy fire building anywhere, anytime. This fire steel is very light, small, simple and utterly reliable, with a little dry tinder you can have an instant fire. If you have any questions about this product by Hotts Outdoor Co., contact us by completing and submitting the form below. If you are looking for a specif part number, please include it with your message.